A RUP LIFE: May Favorites! Can you believe it is June already? Last month I've really been focusing on using things I already have on hand and rediscovering some old favorites. 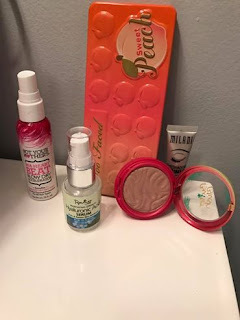 I'm trying to do a 'no-buy' for new makeup but I've already broken it twice with a new foundation and a new mascara - I have a feeling they will show up in my next month's favorites because they are good but I haven't been using them long enough to say for sure. At first I wasn't a fan of this palette. I think maybe it was because of all the peach/pink shades and it being winter time when I got it. A few shades do not show up wonderfully but for the most part the whole thing is very pigmented and has lots of sheen which I like. Once the warmer weather hit it has been the palette I reach for every day. I can see this being my favorite all summer long. This is a subtle blush but I wear it almost every day. I think with me being so pale it is one of the few that doesn't make me look like a clown. I like the Natural Glow shade too which is peach but that has a lot of shimmer so I use it to top the plum rose some days. The best part about this blush is that it smells sooo good. Like a tropical vacation. Hyaluronic is great for helping dry skin. It attracts moisture and it has been a perfect addition to my skin care. I reviewed this / used this a few years ago but I recently repurchased because my skin missed it. It is a must for dry skin. This smells yummy, detangles and helps my hair to dry faster. I love it. I got mine in a beauty box some time ago but I will be buying the full size soon. I didn't like this at first. I like a thicker style like Mac's painterly pot but I needed something and was at target (so many purchases start that way!) So I gave this a try and it works well. It is fairly cheap and a little is all you need so it will last a very long time. Perfect for keeping shadows on strong. So that is it for May! I'm already working on this month's favorites so stay tuned! !